It was just about a year ago that I decided – in a rare enlightened moment – that “With All Due Respect” would make a great title for a blog where I could express my opinions about government decisions impacting land use and the environment. By December 2013, I applied to the U.S. Patent and Trademark Office for a “service mark” to use that name while providing news analysis and commentary on topics of interest to me professionally and personally. Thanks to Geoff Kelly at ArtVoice, I used the “With All Due Respect” mark in commerce for the first time on January 30, 2014 in a guest essay. 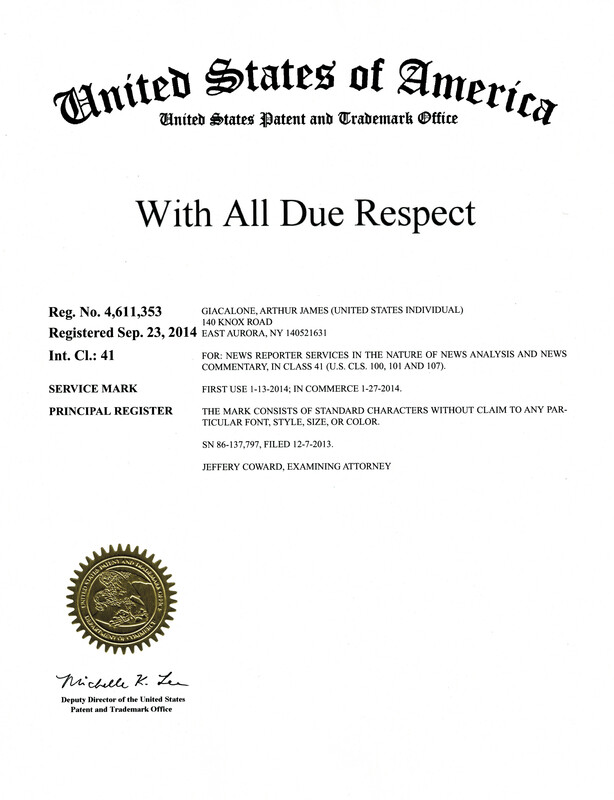 On September 23, 2014, the mark was officially registered in my name by the USPTO. But, by then, I had entered into an agreement to assign my right and interest in the mark – my “baby” – to an unidentified party for use as the name for a political talk show. Given the fact that, in return, I was being granted a license to continue using “With All Due Respect” in conjunction with this blog, related articles or commentary in newspapers and publications, books [fiction or non-fiction], and Continuing Legal Education classes or programs, I asked for and was given assurances that the phrase was not going to be diminished – at least, in my eyes – by association with some mindless, hate-filled, right-wing talk show. 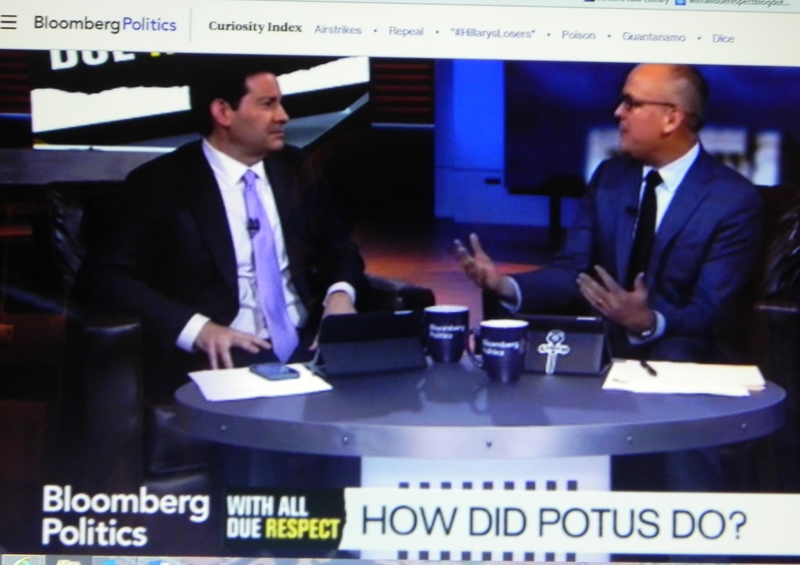 On October 6, 2014, Bloomberg Television premiered “With All Due Respect”, co-hosted by Mark Halperin and John Heilemann. Promos for the show promised to provide “the high human drama of politics” and “fun” – in their words, “like a taco bar and a sushi bar, all in one.” [Okay, I’ll admit that I’m just a working-class Western New Yorker who is not exactly certain what that means.] I have not watched the program – which airs weekdays at 5 PM ET. Have you? How are they doing? Initial reviews were not exactly glowing. Are they maintaining the quality that I have attempted to provide visitors to this site? Should I feel comfortable with sharing a name – but otherwise not an affiliation – with the Bloomberg TV show? PLEASE LET ME KNOW. P.S. In case you’re wondering why Bloomberg TV chose the name, With All Due Respect, here’s what the co-hosts told David Carr in a New York Times interview: “Why is the show called “With All Due Respect”? Halperin: In Washington, 80 percent of the time, what they mean when they say that is, I’m about to kick you between the legs. Heilemann: “Due respect” could be a whole lot, or it could be virtually nothing.” That sounds about right to me. P.P.S. I’m told that Bloomberg television is available in WNY through: DIRECTV (Channels 353, 353 [HD]); DISH Network (203, 203 [HD]); Time Warner Cable (207).